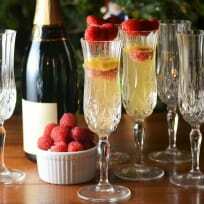 This raspberry mango bellini will put some sparkle in your holidays. Everyone needs a little bubbly in their life! This spiced cranberry rum old fashioned will start your evening off just right. Turn up the Christmas carols and light a fire, because it’s about to get cozy. Christmas sangria is so easy to make! 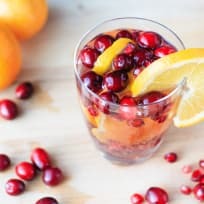 This cranberry, orange and pomegranate drink is the perfect addition to your holiday plans. 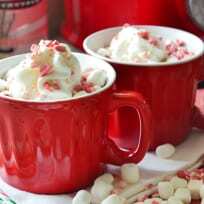 This boozy slow cooker peppermint hot chocolate will be a huge hit for your Christmas party. It’s easily adapted for kids too, making it great for everyone! Try a Spiked Chai Latte on a chilly holiday night. Full of freshly spiced black tea, warm bourbon, and rich frothy milk, this nighttime cocktail is sure to warm you up. This green tea cocktail is hard to resist! Champagne, pomegranate juice and green tea blend together in this tasty and simple cocktail to help you celebrate the holidays. This spiked mocha latte is made with homemade chocolate coffee moonshine. Make it for yourself, give it away as a gift – no matter what, you’re a winner! 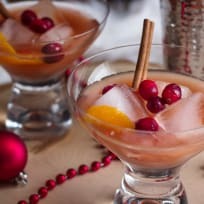 Cranberry punch is a super easy and delicious drink to have around for the holidays. There’s even a non-alcoholic version for the kids! This rosemary yuzu gin fizz is woodsy and botanical, with underlying notes of citrus. One sip of this gin-based cocktail conjures up images of a winter wonderland. We recommend drinking it inside, next to a crackling fire. Hot spiked cider will warm you up, inside and out. Bring on the cinnamon whiskey! This cranberry orange Moscow mule is sure to make your season bright. It’s full of festive flavors and vodka too! Gingerbread eggnog is a grown up great that fits right in with the festive season. Sorry, kids, this one’s not for you!